This is a Chinese and Malay plus Indian oriented island with some colonial British remains. An ideal exotic vacation destination with a large urban spot called Georgetown Penang which is marvelous for oriental shopping excitements. 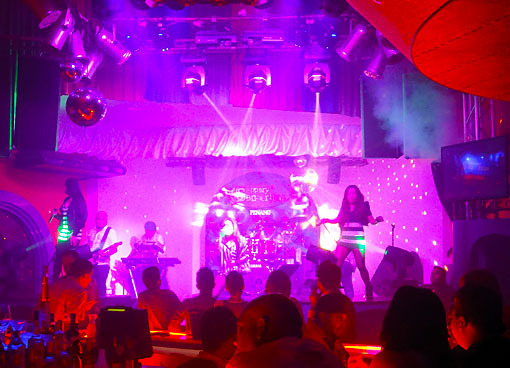 A good entertainment infrastructure with bars, pubs, discos, live music in lounges and parlors and the ever-present food attraction make some days in north-west Malaysia truly enjoyable. Great hawker center and food courts and plenty of Chinese and Indian people who make sure that things works and religious ideas are not taking over completely since frankly speaking who likes that ideological fantasy taking over life? It's already too much anyway. Pulau Pinang or the “The island of betel nuts” is the top tourist destination in Malaysia and plenty of people use flights and buses plus other road travel every day to have a good time in Georgetown and Batu Ferringhi. The island is also known as the "Pearl of the Orient", this Malaysian state consists of the island Pulau Pinang (Penang) and the mainland coastal strip known as Seberang Prai (formerly Port Wellesley). The 13.5 kilometer Penang Bridge is the third longest road bridge in the world. There is an even longer new one, see pics below. 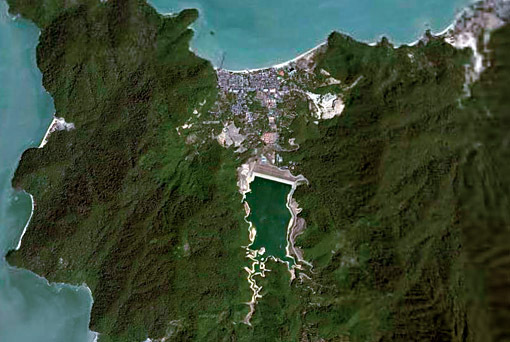 The picture below was taken at the north east coast that strip on the Andaman Sea is Batu Ferringhi the main beach spot. Most tourist stay around here. 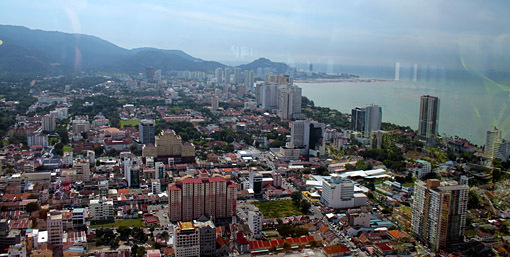 The State of Penang is a island of 290 sq. km and a 800 sq. 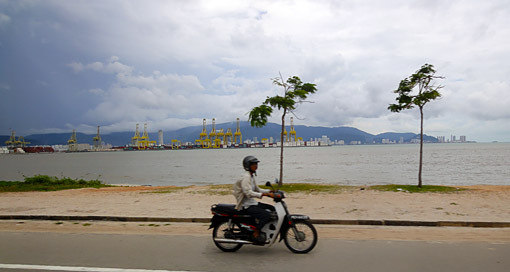 km strip along the coast of the mainland known as Seberang Peri (Province Wellesley). The two regions are linked by the Penang ferry service and two ridge. From British times the island still carry the name "The Pearl of the Orient". The British who ruled this spot in the Andaman Sea for more than a century. data storage products. Including communication products and automotive parts high-tech products e.g. several jumbo freighter aircrafts carry this to Australia and elsewhere. Several marvelous old buildings are a great showcase of it. Chinese clan houses, missionary schools and places to worship. Recommended places to visit are the Penang Museum and Fort Cornwallis plus Acheen Mosque. Other interesting spots are Kapitan Kling Mosque and the Kek Lok Si Temple plus Nattukotai Chettiar and the Snake Temple close to the airport. They came from China, Thailand, Burma / Myanmar, Sumatra, Java, India and Europe. All have their festivals and celebrations. Penang Malaysia is well-know for tasty food from all of the countries mentioned. In 1786 Captain Francis Light of the Britain East India Company established this spot in the Andaman Sea as the first British settlement in the far East. 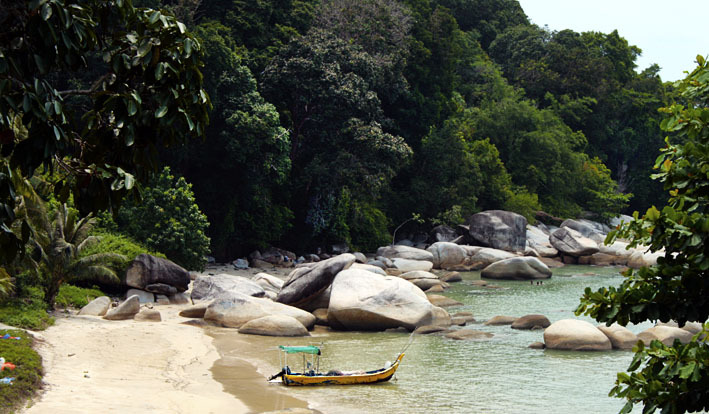 The original name was "Prince of Wales Island", but was later changed to Pulau Pinang, meaning Island of the Betelnut. From the early 1900's the place developed fairly quickly. The first hydroelectric plant was completed in 1905, and the first tramway began operating in 1906. By 1910 Georgetown had been turned into a major port because of the increasing demand for rubber in the West. 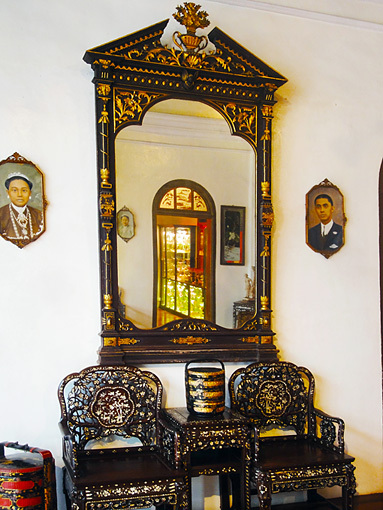 The tin and rubber business brought many immigrants from China in who developed the local Peranakan Style. In 1941, two years after the outbreak of the Second World War, the Japanese invaded Penang, took control of the island and left on 4th September 1945 after surrender. The place remained under British rule until the independence of Malaya in 1957. Today, it's a busy port, manufacturing hub plus tourist center with a multitude of cultures. This is Penang in the Malaysian Andaman Sea. The population is over one million, of which about 50 per cent live on the island. Chinese, Malays and Indians form the three largest groups, with small numbers of Eurasians, Japanese, Europeans and Americans. The capital Georgetown has an unmistakably Chinese flavor, but retains many architectural reminders of its colonial history. Away from the city there are spectacular beaches along the north coast road to Batu Ferringhi, and there is unspoiled natural scenery all along the west side of the island. You never be alone but there are many attraction and great sandy beach fronts, some history to explore, action and nightlife.The place is quite close to Thailand which means plenty of travel back and forward to Danok and Hat Yai which is a preferred weekend, shopping and nightlife-spot of Malaysian people. They come over the gigantic bridge or with the ferry which connects the island to the mainland and Langkawi to the north, the port is also quite significant. This spot in the ocean has a long history which was dominated in the last few hundred years by the British colonial empire since here was starting point of the East India Company routes to Calcutta and finally to Europe. There is still an amazing huge heritage around of that time. Since August 1985 it has been joined to the mainland opposite by the Penang Bridge and now (2015) is a second cross over the canal. The toll is higher than that of the ferry but the 42- mile drive across gives you a great views of the harbor, and you have the satisfaction of knowing that you have just driven over the third longest bridge in the world. Although the toll is rather high they have the usual gridlock every day, many prefer to take the cheaper ferry, which brings them into the heart of Georgetown. History relevant and other places to visit on Penang Island. Although once under the dominion of the Sultan of Kedah, Penang has always been on its own. Until the British came, it was largely deserted despite its strategic position. To encourage trade and commerce, the British made the island state a free port; no taxes were levied on either imports or exports. This strategy worked and in eight years the population increased to 8,000, comprising many immigrant races - Chinese, Indians and Bugis, among others. In the beginning...there was Light: But the story of how the island fell into British hands and developed into Malaysia's leading spot in 1780, when the rulers of Kedah sorely needed help against the imminent threats of a Thai invasion from the north and Bugis attacks from the south, Light persuaded them to trade Penang for British protection. The Kedah Malays agreed, and in July 1786, an English East India Company settlement was formed on the island. The company confirmed its approval of Light's action in acquiring the island but refused to honor the commitment to protect the Sultan of Kedah against his enemies. The angry Sultan tried to recapture Penang but was easily defeated and, as a result, Kedah had to surrender more land to the British - this time, the land between the Muda and Krian rivers opposite Penang island, which was named Seberang Prai by the Malays. First are the beaches of which are many and most are well maintained and having still a affordable environment. 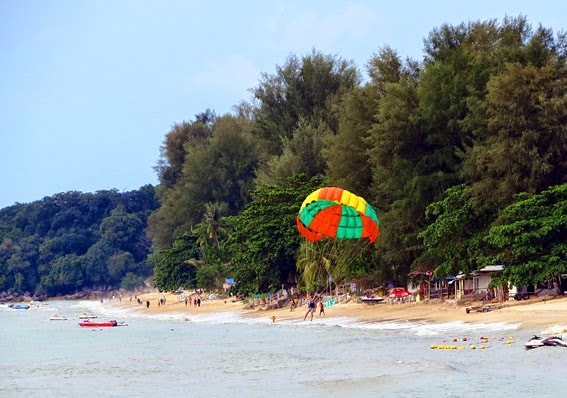 Top waterfront destination is Batu Ferringhi and the warm tropical Andaman Sea along the north road coming from Georgetown, read more. 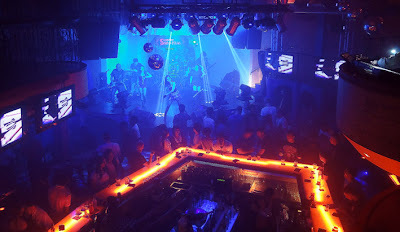 Second is nightlife and entertainment in Georgetown which is the capital and at the main tourist spot which is Batu Ferringhi on the North West coast. There is no much going on with nightlife girls although there are a view bars with them in the capital. This places can easily identified because at the door is written: no entrance under 18 year of age. Third, just relax and go shopping, there are plenty of interesting goods especially from China, Indonesia, and India. Everywhere on the island unique food is available. Having roots in India, China and the neighboring countries Thailand and Indonesia is available. Numerous festivals are on during the whole year. One of the most famous festivities in Malaysia is Thaipusam which is very similar to the vegetarian festival in Phuket Thailand. Actually, it looks as if the Thai copied it to lure tourists onto the island. They copy anything which brings money but finally, the roots to all this has it's source in India. Fourth is eating the variety of tasty food is overwhelming which is mostly Indian and Chinese. All this makes perfect holidays, most people are of Malay, Chinese and Indian origins which guarantee a real exotic environment. Different nationalities migrated to the island since British Colonial Times leading to a very interesting mix of culture. For the travel are myriads of hotels, from the cheap accommodations to the very luxury hotels and resorts in Georgetown and the beaches. A Kuala Lumpur drive is about four hours driving to the south on an excellent tollway which would need some maintenance. It is the same story as in Thailand they build a good highway once and after they forget it since that cost money which nobody wants to spend although this is a tollway, read more. From the border, at Danok in Thailand, it's about 2 hours driving. 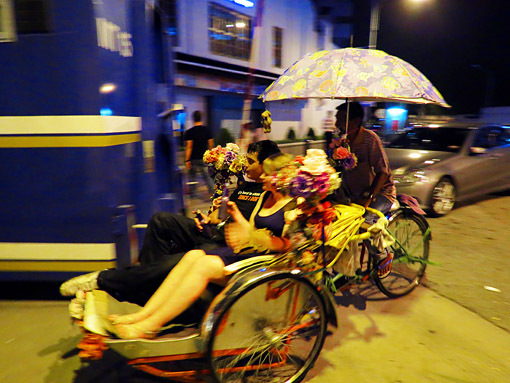 Many guys from the area do some tours to this town and Hat Yai to have some nightlife fun. The summary of this page is to give you an idea of what to do in and places to visit on Penang Island. After sunset Penang nightlife becomes virulent.Nightlife action is mainly in Georgetown the island’s capital and Batu Ferringhi where the night market shopping is plus a couple of good restaurants including bars and lounges some with live music. Batu Ferringhi is the best tourist beach on Penang Island. Hot beats are presented by Filipino bands with live music. People can also do a little open air dancing in Georgetown at upper Penang road which is sometimes very amusing to watch, it has many facets. Bar's, clubs and discos lounges and hidden parlors with pretty girls from China. Fashion Silver JewelryWith new ideas, forms, designs, manufacturing and purposes.Here are so many beautiful silver novelties antiques and just pretty jewelries bangles and necklaces plus earrings inclusive finger rings and more. Have a look for going shopping with or without gemstones. Sterling silver is one of the most popular metals for jewelry and that also has something to do with the settings. Just try our prices quality and designs are convincing just try it will brighten your day. It will tarnish with time, but a little rubbing with a polishing cloth, and it will look good as new.